Seven centuries ago you might have asked for directions to Rothenburg ob der Tauber and been told: Go up the Rhine to Frankfurt. 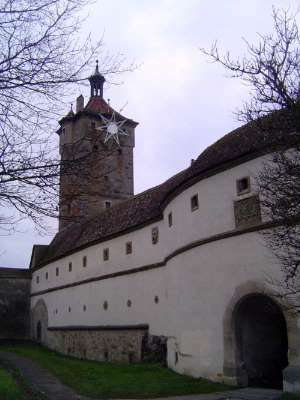 Then head east up the Main 70 miles to Wertheim and from there follow the Tauber 50 miles until you're almost at its headwaters in the hills overlooking the Danube. If you had made that trip in the 13th century, you would have found a walled city proudly designated as a Reichsstadt or free imperial city. It survived, independent, until 1802, when it was absorbed into Bavaria. 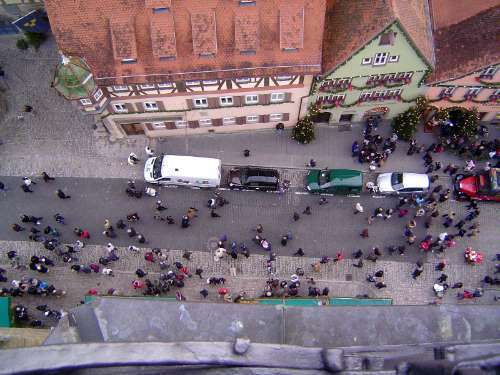 Nowadays, nobody has a clue how rainwater flows from Rothenburg to the sea, but every year 2.5 million visitors come anyway. From Frankfurt, they take the A3 east 130 kilometers, then switch to the A7 for 50 kilometers until exit 108. They struggle to find a parking place and then walk to a vestige of the medieval world. By 1963, August Schnizlein's Führer durch Rothenburg ob der Tauber was in its 42nd edition. 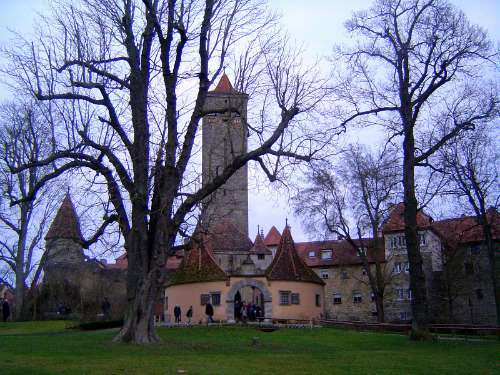 Frommer got the message: Rothenburg, his guide states, "is a thoroughly enchanting, utterly authentic, and totally unaltered town of the Middle Ages, with fairy-tale-like castle, cobblestoned streets, and massive city walls." Another guide calls Rothenburg "probably your only chance to see a nearly intact medieval walled city... not a single building in the entire town was built after the Middle Ages." 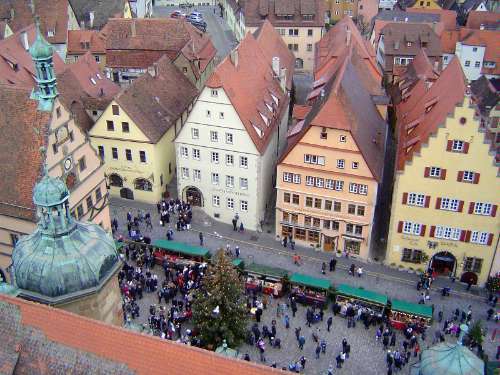 Rick Steeves invites readers to "get medievaled in Rothenburg," but you probably have to be 18 for that. Spoiler ahead: yes, all this is too good to be true. Half of the walled city was destroyed by American bombers on March 31, 1945, and another third of it was demolished by the Germans themselves in the following years. 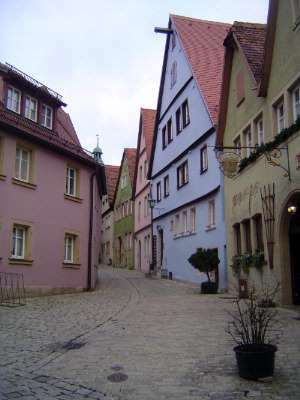 Besides, if by medieval we mean before 1500, then there is very, very little of Rothenberg that qualifies. 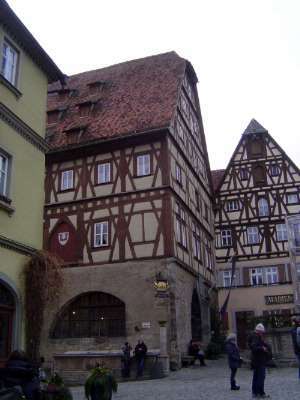 An American scholar, Joshua Hagen, estimates that more than three-quarters of "old Rothenburg" was built after World War II. His writings on the subject include: (1) "The Most German of Towns: Creating an Ideal Nazi Community in Rothenburg ob der Tauber" in Annals of the Association of American Geographers, 2004; (2) "Rebuilding the Middle Ages after the Second World War: the Cultural Politics of Reconstruction in Rothenburg ob der Tauber, Germany," Journal of Historical Geography 2005; and (3) Preservation, Tourism and Nationalism: The Jewel of the German Past, 2006. In 1946 the director of the Bavarian Office for Historical Preservation wrote that Germany was no longer a political or economic power. It had instead only the knowledge "that we were a cultured people of European and international importance, no, much more than that we still are one" (2005, p. 95). Which doesn't mean that tourist dollars weren't on the agenda. 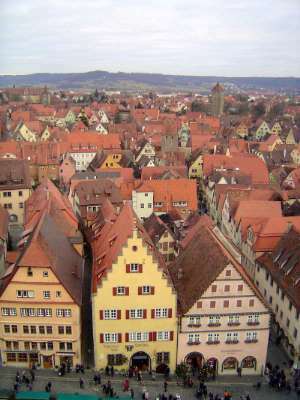 Nobody thought of Rothenberg as a tourist magnet during the first half of the 19th century, when the town lost a tenth of its population. Why the loss? After 1802 the town was in Bavaria but near its edge, and it faced tariff walls when selling into its traditional market area, after 1802 largely in Württemberg. 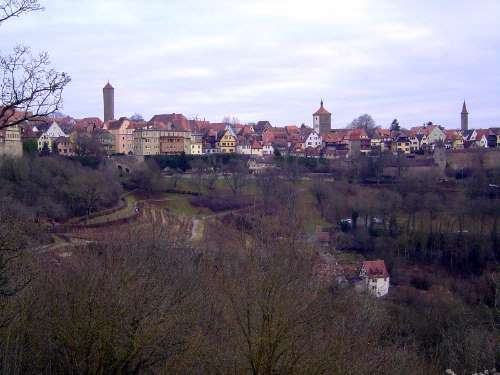 That's why the journalist Friedrich Lampert could write in 1858 that "few of the former free imperial towns have fallen so far down since the collapse of the old Empire as Rothenburg. 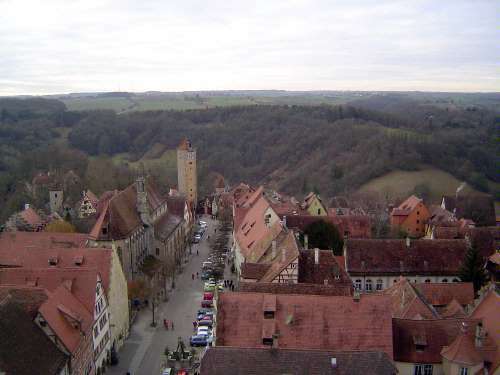 Its present is cut off from its past by a chasm just as deep as the valley that separates the town from the opposing landscape..." Rothenburg, he continued, had "unfortunately lost all of its meaning.... There are towns, as well as entire countries, which, having played out their roles, can no longer be helped up" (2006, p. 43). Just as Bruges was rediscovered at about this time, however, so outsiders found Rothenburg. In 1865 Wilhelm Heinrich Riehl called the place "the most purely medieval, of all the old German cities I know" (Hagen, 2006, p. 96). 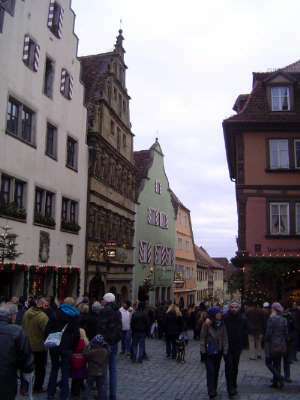 By 1876 Baedeker called Rothenburg a place "where the visitor feels transported back to past centuries as if by a magic wand" (2006, p. 88). 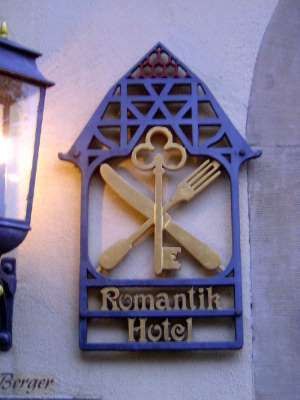 Soon, people who had never been to Rothenburg began dreaming about it. Hagen quotes a letter written in 1874 by no less than Nietzche, who Hagen says probably never set foot in the place yet wrote, "...I am once again seriously making plans, in order to make myself completely independent and withdraw from all official connections to the state and university into the most imprudent solitary existence, miserable and simple, but dignified. 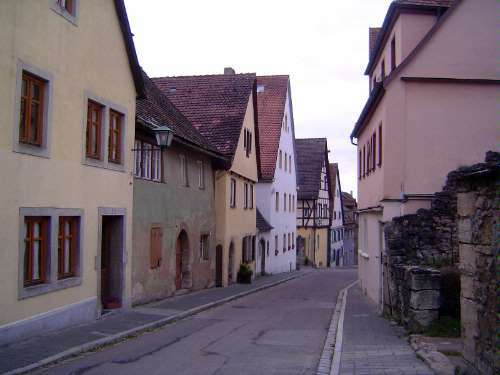 For now, I have selected Rothenburg ob der Tauber as my private castle and heritage.... Everything there still continues in an entirely old German manner; and I hate the characterless mixed cities that are no longer whole" (2006, p. 143). 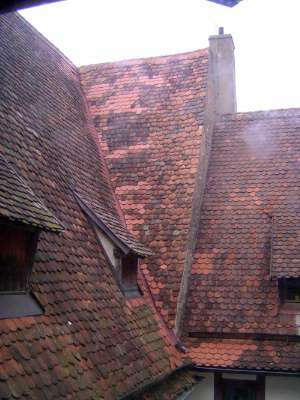 Rothenburg's engine of preservation was a historical society, the Verein Alt-Rothenburg or Old Rothenburg Union, which first met in 1898. 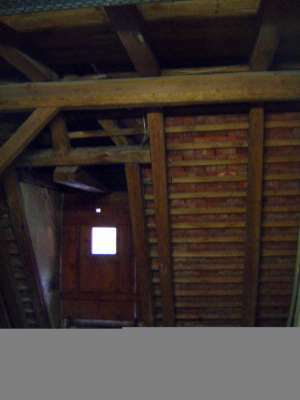 Among its tactics: preserving half-timbering and even stripping away plaster to reveal timbering that had always been covered. Here's an example: old photographs show the facade of the corner building entirely plastered (2006, p. 169). It was an about face from the early 19th century, when the city had decreed that "outer walls, embankments, ditches, and walls as well as the towers shall be sold as sections and the new owners shall be permitted to level these out to beautify the town" (2006, p. 23). As late as the 1920s the town permitted Shell and Esso gas stations within the old-town walls. No longer, of course. 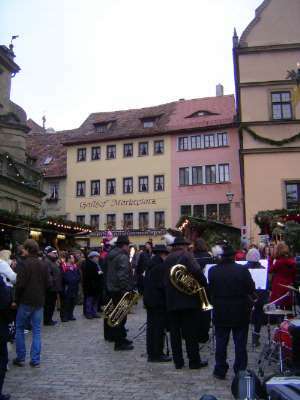 The picture here shows the Christmas Market, first opened in the 1930s. The market was an on-again, off-again affair until the 1970s, when Käthe Wohlfahrt opened a store. 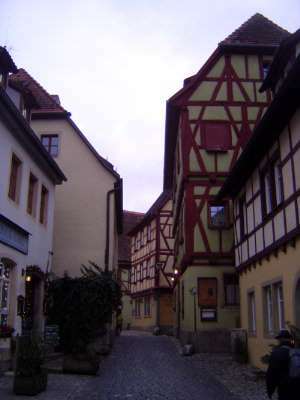 By 1996 the company had six stores in Rothenburg, plus branches as far afield as Tokyo. 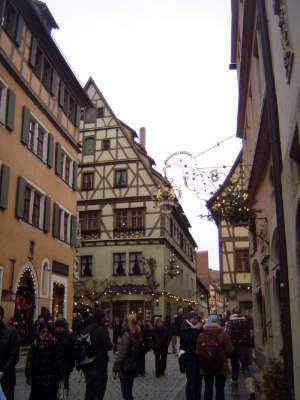 Tokyo wasn't an entirely surprising choice, because the largest foreign contingent visiting Rothenburg comes from Japan. The guesthouse is one of at least 20 places to stay in the old town; that many again exist outside the walls. The tourist industry grew steadily in the prewar era, from 10,000 overnight visitors in 1906 to over 50,000 in the 1920s. Postwar reconstruction was delayed for a couple of years by shortages of building materials, but the old street network and property boundaries were retained, and reconstruction was approximately finished by 1956. Many of the new buildings had the somewhat stripped look of the building on the left, but many new ones had non-structural half-timbering. By 1956 over 100,000 visitors stayed overnight, matching the pre-war peak. The town was by then acutely aware of its dependence on its historic appearance. As one resident wrote in 1950, "The economic existence of our town stands and also falls with the preservation of our Stadtbild." Walter Hass, a member of the German delegation to a symposium of ICOMOS, the International Council of Monuments and Sites, wrote: "When bars appear that no Rothenburger wishes to go into; stores in which no locals shop, when Rothenburgers put out decorations, not to celebrate a festival, but in order to feign customs that were never customs, then the preservation of the town is not to be expected... Rothenburg can only be preserved by people, who live in the town and live their own lives there" (2006, p. 272). New? Old? Hard to say, although the rule of thumb is that everything east of the market square is probably new. 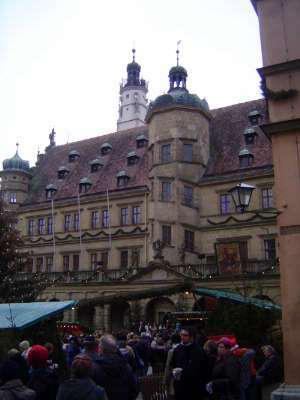 The Rathaus or town hall is itself a postwar reconstruction, although that fact isn't advertised. Nor is the town's history as an enthusiastic supporter of the Nazis, who in turn loved all celebrations of the German folk. 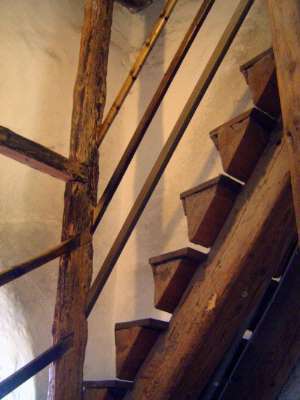 So the stairs aren't really 500 years old. Does it matter? The craftsmanship is crude yet elegant. 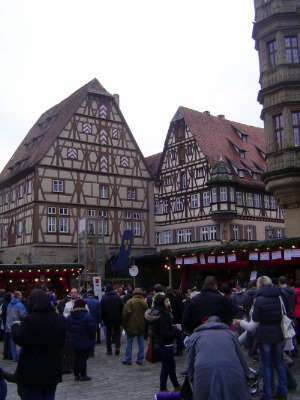 The Market Square and Christmas Market. Wassily Kandinsky was here in 1901 and later wrote: "Following some good advice I visited Rothenburg...I felt as if some magic power had transported me against all laws of nature from century to century...[I] go up to the rooms, the narrow room and the sea of bright red roofs which I can see from my window"(2006 p. 84). The view here is eastward, where almost everything was bombed out in 1945, so Kandinsky definitely didn't see these buildings. Yet the general appearance is close to what he saw. 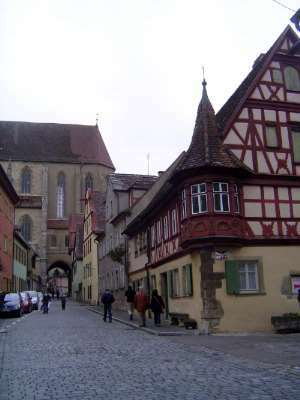 In 1963, Erich Maria Remarque wrote of a post-war visit: "I came to Rothenburg. And here was suddenly peace. The town stood there as always with its nooks and walls and alleys and dreams, undisturbed by all the horrors, like a bastion of hope, of solace, and a second home for the distraught soul. It has remained that for me" (2006, p. 109). Of course it hadn't been undisturbed: photos from the 1930s show swastikas flying from many buildings, and much of what Remarque saw was new. That's the city tower or Burgthor at the edge of town; it shows up on an 1899 tourist map. More, with a bit of ruins on the right; presumably charred in 1945. Would the lure of the place be as strong if its inauthenticity were understood? Answer: probably yes. After all, Disneyland is a popular place, and few object to its recreation of distant places. Hagen in fact reports a conversation with a Disney World designer who was asked how Disney had represented Germany. 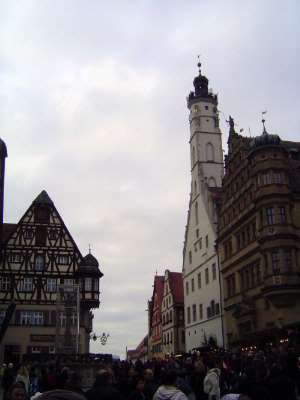 The reply was that the place "we primarily thought of was Rothenburg ob der Tauber... Everything was somehow inspired by Rothenburg" (2006, pp. 293-4). So Disney's Germany is a copy of a copy.